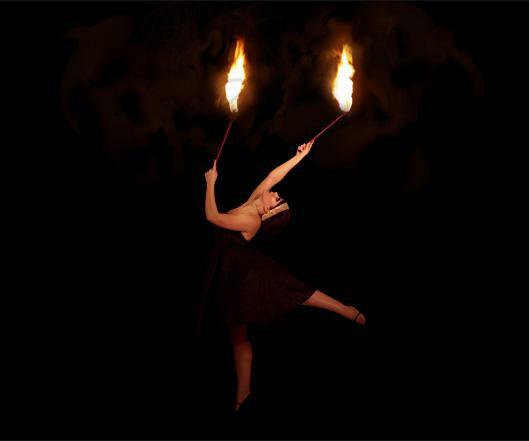 Divine produces memorable and high impact fire performances designed to knock your guests’ socks off! Adding that elusive element of fire and excitement, they have earned a strong reputation for producing highly engaging, original and skilfully produced work. 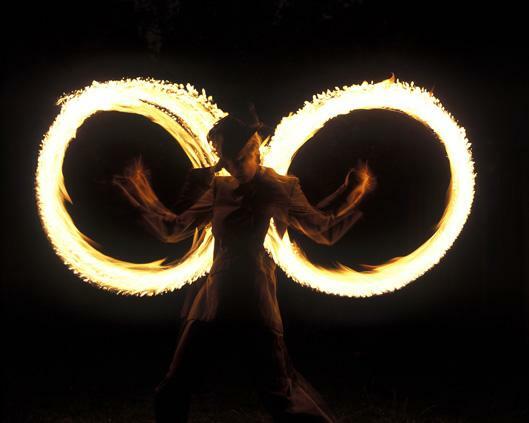 These fire performers are mesmerising and will impress guests at any event! 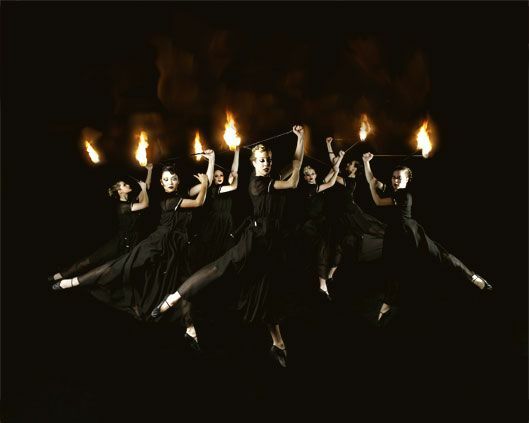 Divine’s fire ballet dancers have created an unforgettable show that is not to be missed. These fire dances are the perfect accompaniment to any stylish occasion. The Debutantes are elegant, gracious and ever moving. For a wandering performance, dancers can wear portable sound systems or lights if required, and dance in unison or improvise separately. Stage shows can be set on traditional stages or all sorts of other spaces. This is a red hot and wickedly funny walkabout from the inferno. In velvet, leather, crystal and silk, this sinfully skilful and deeply decadent performance will utterly indulge your audience, leaving them greedy for more. See you in hell. The Devils can perform as interactive wandering characters, for example, welcoming guests to ‘Hell’, checking the sinfulness levels of individuals with a short, hilarious questionnaire and then awarding Bad-Behaviour stars or gifts. They can dance in groups of devilish unison, accompanied if required by their own wearable, portable sound system. Pit them against the Angels for uproarious results! 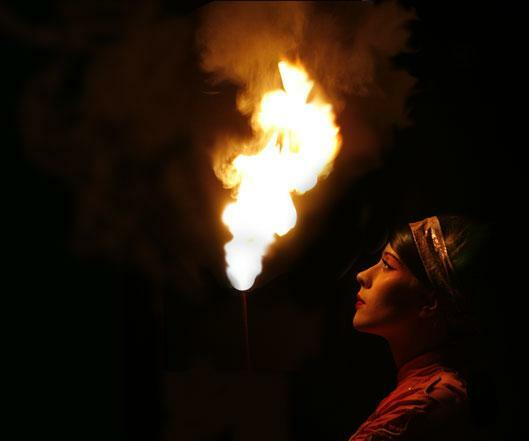 This is one exquisite and exceptionally beautiful flame dance. 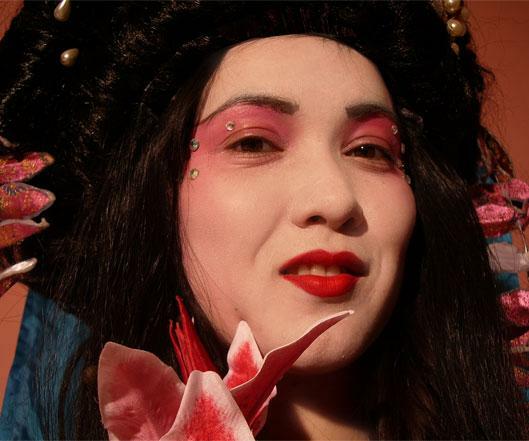 These ornate and courteous characters can interact with the audience talking with a few Japanese words or perform delicately choreographed dance-about, dressed with lights and accompanied by their own portable music system if required. They can also perform choreographed staged performance. Mimi is on fire. Sweltering sensual performance from the Divine Pussycat! Mimi can perform as Cat Woman, adding sparkle to a party, or a more traditional cat, for family or animal themed events, where she can also appear alongside Fifi Le Poodle. She makes a great hostess, welcoming others like old friends and working the room, she can also be called upon to make announcements or presentations, sing and dance. This exquisite fire performance is dressed in floor length chiffon and crystal. This act is spectacular, dramatic and certainly unforgettable. 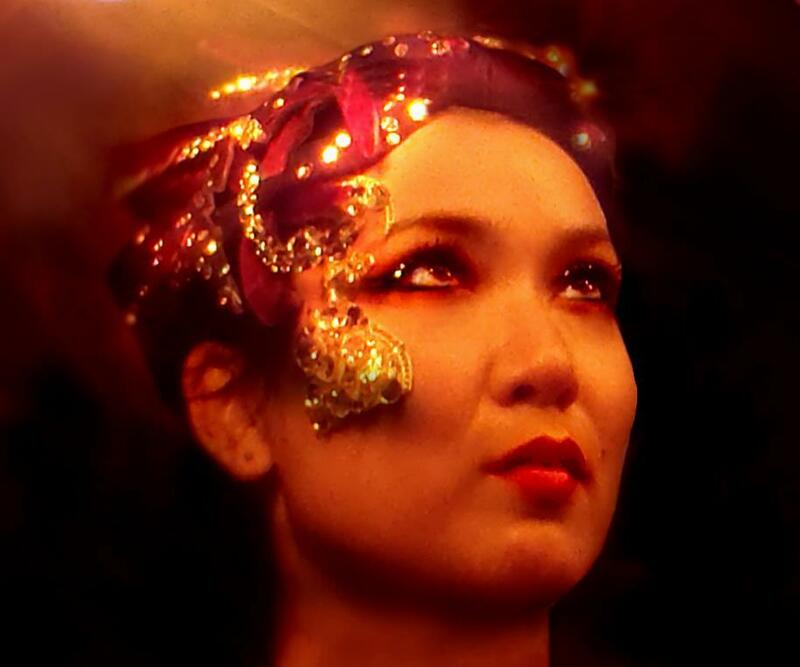 For a wandering performance artists can wear portable sound systems or lights if required. They can dance in unison or improvise separately. Stage shows can be set on traditional stages or all sorts of other spaces. As well as creating shows to fit our clients’ specifications we have a readymade piece, The Firegown. A powerful 10 minute staged performance. 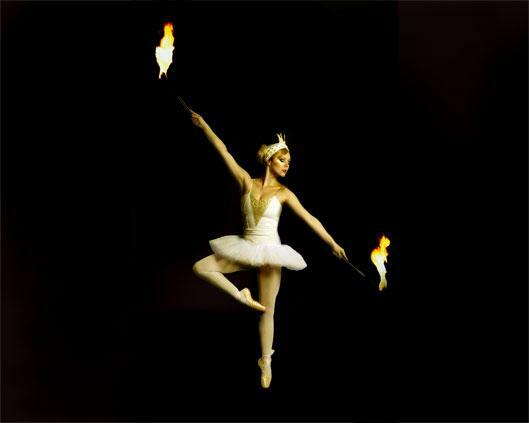 Classically trained dancers perform a dazzling fire ballet set to Bach’s Passacaglia. 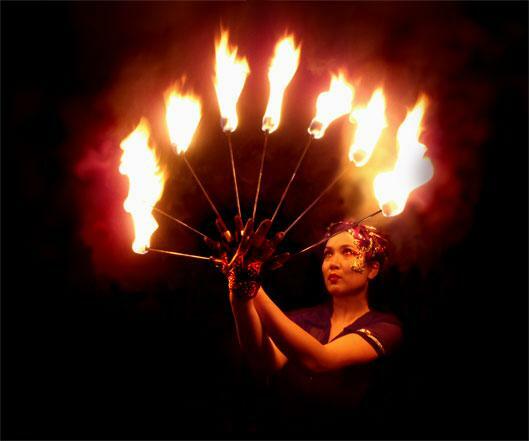 Fire fingers give an exciting twist to our fire performances. 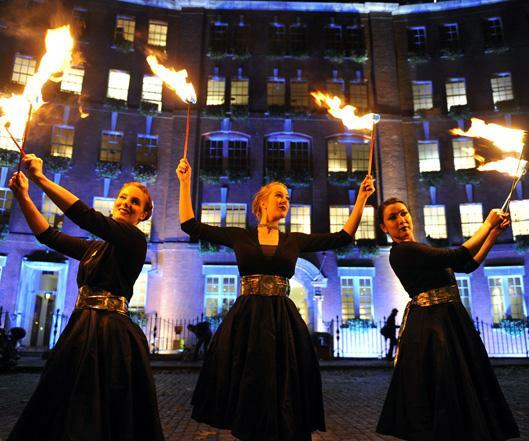 They can be used to great effect as part of a dance about or a staged performance, combined with other fire props or seen on their own. Bask in the warm glow of nostalgia as Southern belles two-step to classic country tunes. For a wandering performance, Southern Belles can perform a choreographed dance-about, accompanied by their own portable music system if required, and are also available for staged performance. Razor sharp and red hot, Tailor Made is a smouldering, smart and stylish jazz act inspired by the works of Bob Fosse. For a wandering performance, Tailor Made can perform sharp, slick choreographed dance-about accompanied by a portable music system if required, and are also available for Jazz style staged performance. 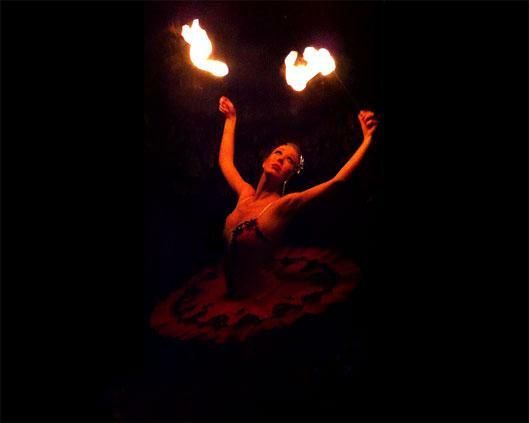 the Exquisite fire dancers are dressed in classical tutus. 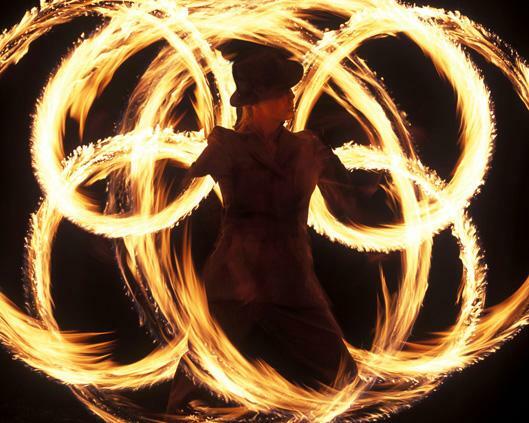 For powerful staged performances and dance-about with fire clubs, fire finger or miniature fire wands. For a wandering performance, The London Cirque Ballet can dance in unison or individually, welcome and guide guests. They can be dressed in lights. They can of course also perform stage shows. Each act varies between 5 – 10 minutes, but this depends on the number of dancers in each performance. Divine can also make shows longer or shorter to accommodate the client’s specific requirements.